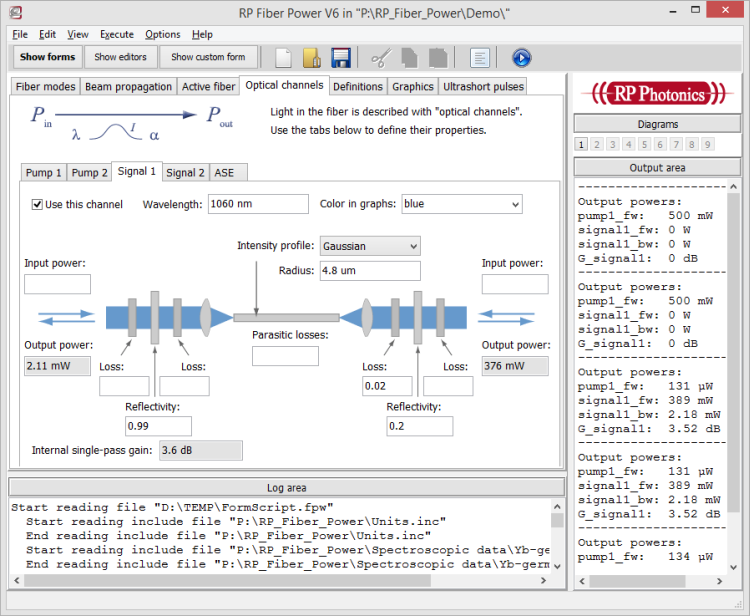 Abstract: RP Photonics has published new video, which gives a complete overview on the software RP Fiber Power V5. We have published a new video, which gives a tour through all essential features of the RP Fiber Power V5 software. This should be interesting for everyone considering to buy some simulation software for fiber optics – be it for passive or for active fiber devices. To see the video, follow this link: video/quick_tour/quick_tour.html. Those who already have the older version V4, and could thus have an upgrade, may also (or instead) want to look at the video on numerical beam propagation, which is the new feature. Note also that there are several new case studies made with the software, and two new comprehensive fiber optics tutorials for which RP Fiber Power has been used extensively. I just discovered a bug in our newsletter software settings: the previous instances of this newsletter were send to the subscribers of the Photonics Spotlight newsletter instead of the subscribers for the RP Photonics Software News! I am really sorry for that. Those subscribers who do not receive the Photonics Spotlight newsletter, and therefore missed the previous postings, may read these on our website.